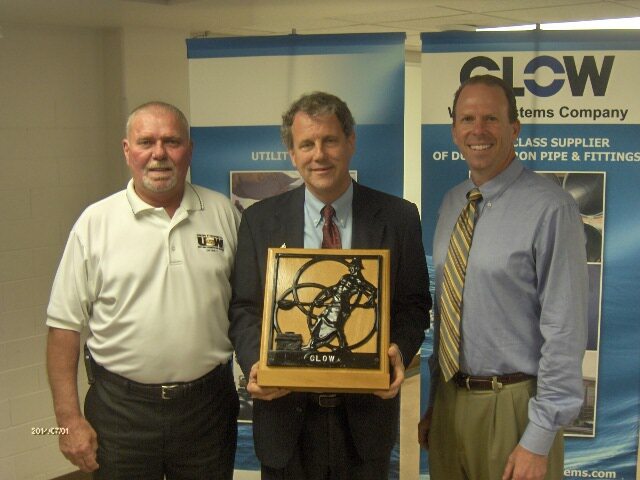 Senator Sherrod Brown | McWane, Inc.
COSHOCTON, OH – On Wednesday, July 2, 2014, U.S. Sen. Sherrod Brown visited Clow Water Systems in Coschoton to highlight recent legislation signed into law by President Obama that benefits Ohio manufacturers. Brown introduced, and helped pass, an amendment to the Water Resources Reform and Development Act (WRRDA) that would ensure American-made iron and steel are used in federally-funded water infrastructure projects when available and competitively priced. The amendment benefits Ohio manufacturers like Clow Water Systems in Coshocton, and Nucor Steel in Marion. WRRDA connects businesses and communities throughout the country with critical resources for maintenance, inspections, and upgrades to water infrastructure projects. Brown’s amendment extended Buy America provisions, which ensure that federal taxpayer dollars spent on public infrastructure utilize American-made materials and labor, to water infrastructure projects. Before passage of WRRDA and Brown’s amendment, Buy America applied to federally funded roads, bridges, and rail projects but not water infrastructure. Brown continues to champion the cause of domestic manufacturing and its workers. Described as “Congress’ leading proponent of American Manufacturing,” Brown is a member of the Senate Manufacturing Caucus, currently Vice-Chair of the Senate Auto Caucus, and was recently named incoming Chair of the Senate Steel Caucus.